JAKARTA (foresthints.news) - Indonesia's Minister of the Environment and Forestry Siti Nurbaya and Acehnese leaders, Malik Mahmud Al Haytar (Wali Nanggroe Aceh, or Guardian of Aceh) and Zaini Abdullah (Governor of Aceh), have declared a moratorium on the expansion of palm oil and mining in the Leuser Ecosystem. This will include a review of all the operations of palm oil plantations and mines located in the area. Furthermore, the minister and the Acehnese leaders also agreed to stop all land-clearing operations in the Leuser Ecosystem while the review process is underway. �This very important step we have taken represents a concrete follow-up to the directive of President Joko Widodo who has demanded a halt to the expansion of palm oil and mining. I really appreciate the positive response of the Wali Nanggroe Aceh and Aceh Governor, both of whom have expressed their willingness to take the initiative in following up on the president�s directive,� the minister told foresthints.news just before midnight (Tuesday, Apr 19) after her meeting with the Acehnese leaders. 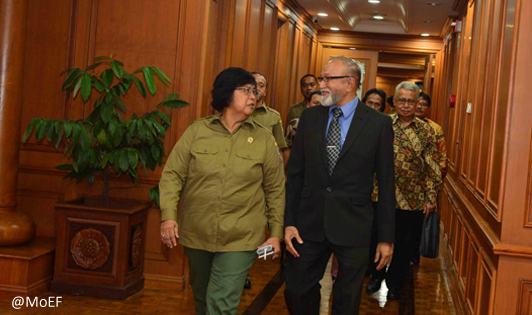 After holding a closed meeting, Minister Siti Nurbaya, the Wali Nanggroe Aceh and Aceh Governor discuss the Leuser Ecosystem with top officials from the Ministry of the Environment and Forestry and the Aceh government. In the meeting, the minister said that President Joko Widodo's decision to order a moratorium on the expansion of palm oil and mining demonstrates his real commitment in response to both local and global concerns. It also sheds light on the Indonesian government's efforts to improve the productivity of the country�s own natural resources and provides indisputable evidence of Indonesia's contribution to resolving climate change issues. �We are still busy preparing the details of the moratorium. After the completion of this phase, we will release details of the next phase. However, I can say that a moratorium on the expansion of palm oil and mining in the Leuser Ecosystem is set in stone. This is thanks to the Acehnese leaders� quick response to the directive of President Joko Widodo,� the minister explained. The minister went on to say that one purpose of the imposition of a moratorium on palm oil and mining in the Leuser Ecosystem is to provide time and space for reviewing the landuse allocations in the Leuser Ecosystem, which are to be adapted to the carrying capacity of the environment, the economic needs of communities, and key wildlife habitats while also taking global perspectives into consideration. Confirming the minister's statement, the Governor of Aceh was quick to assert that he would soon take concrete steps in response to the President's directive, especially with regard to the points discussed with the minister. "The Governor of Aceh will immediately impose this moratorium on land-clearing in forested areas of the Leuser Ecosystem for the expansion of palm oil and mining. 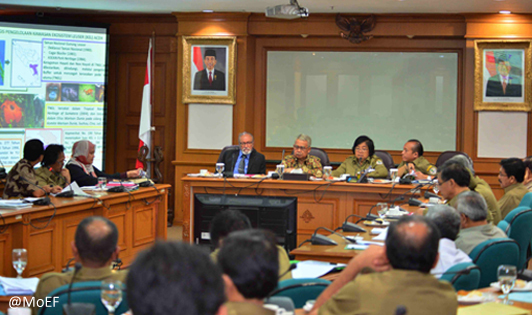 This applies both to companies with existing permits as well as to the issuing of new permits?,� the Aceh governor explained in a written document given to foresthints.news (Apr 20) by the Executive Director of Greenomics Indonesia, Vanda Mutia Dewi, who was intensively involved in the technical facilitation of the process. �I am very happy that the first place in which the President�s directive is going to be implemented is the Leuser Ecosystem,� Vanda said. Discussing details of the palm oil and mining moratorium process in the Leuser Ecosystem on Wednesday morning (Apr 20). Aceh Governor, Zaini Abdullah (center), flanked by the Wali Nanggroe Aceh, Malik Mahmud Al-Haytar, and the Executive Director of Greenomics Indonesia Vanda Mutia Dewi. The Wali Nanggroe Aceh voiced his firm and unequivocal support for the decision to impose a moratorium on palm oil and mining in the Leuser Ecosystem. The decision represents the handing over of the baton in efforts to protect the Leuser Ecosystem, as mandated by former leaders of Aceh decades ago. �Without the slightest hesitation, I give my absolute support to any measures taken to protect the Leuser Ecosystem, including this moratorium decision. I really appreciate and am full of gratitude for the prompt action of Minister Siti Nurbaya and Governor Zaini Abdullah in reaction to the directive of President Joko Widodo. This is good news for all of us, including all the wildlife in the Leuser Ecosystem,� the Wali Nanggroe Aceh told foresthints.news on Tuesday (Apr 19).